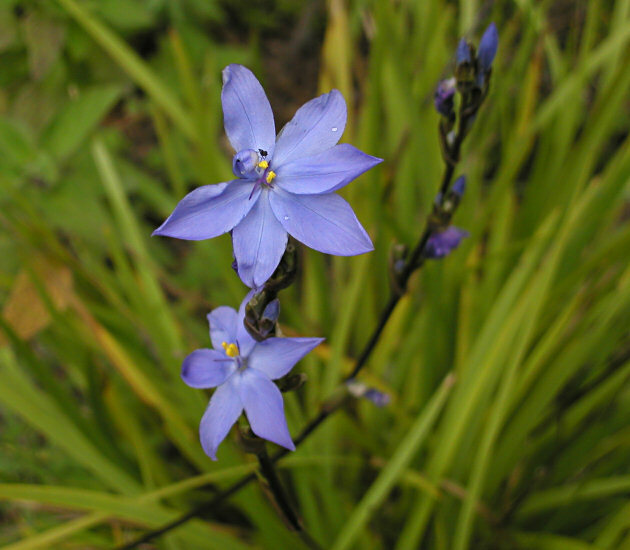 Orthrosanthus is a small genus in the Iridaceae family with 4 species from southwestern Australia and five others from South or Central America. 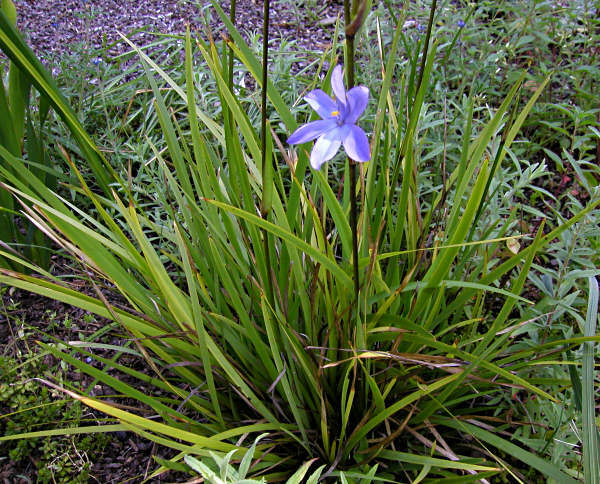 Plants have basal linear grass-like tufting leaves, sometimes with a short creeping rhizome and short-lived blue or white flowers. They are sometimes called Morning Flag or Morning Iris because their flowers are best in the morning and fade as the day progresses. 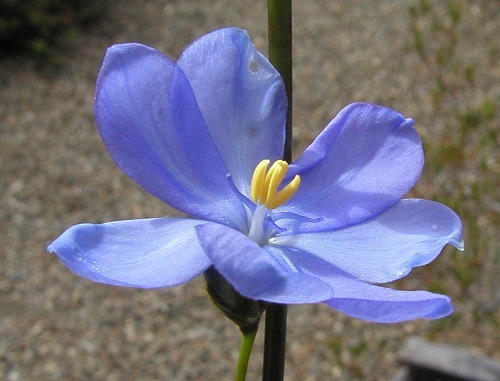 Orthrosanthus chimboracensis is from Central America. 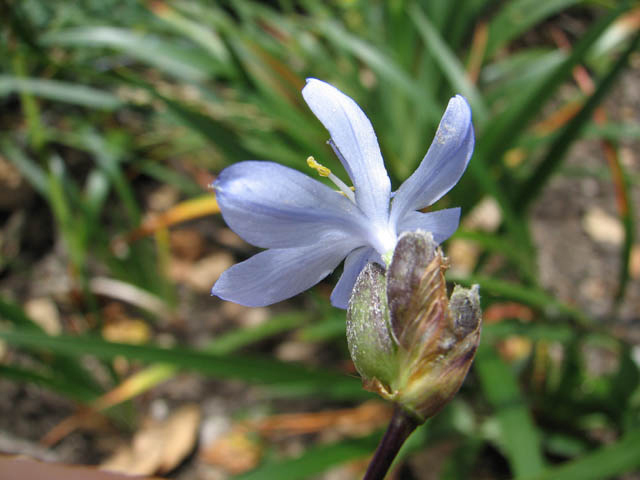 Plants produce many pale blue flowers over a long time with continuous dead heading. Many seed pods and copious seeds are produced. 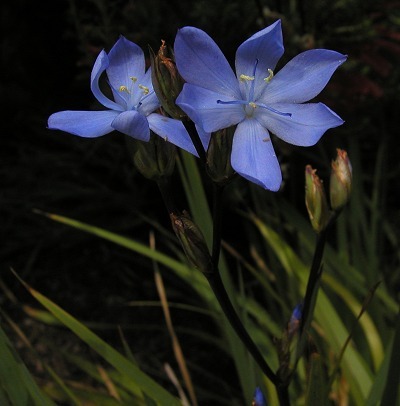 Plants grow to about 1.5 feet tall (~45cm) and are easy from seeds, blooming in 2 years in the Bay Area. Sow the seeds in a well-drained mix. Seeds need a warm-ish summer temperature to sprout. A plant will fill up a 1 gallon pot in about 2 years. Give the plants plenty of sunlight (part sun OK), lots of water, and occasional fertilizer. Plants in pots tend to dry out too fast, even with daily watering. They do not go dormant in the mild Bay Area winter. The best option for this species would be to plant it in the ground where it gets lots of water and will bloom better. However, Mary Sue Ittner finds that in her Mediterranean garden it does just fine with a lot of winter rainfall and not much summer water. It is supposed to be very tender, but it has survived freezing temperatures in her garden (Zone 9 winter temperatures). Photos 1-2 were taken by Mary Sue Ittner and photo 3 was taken by Lee Poulsen in August 2004. He wrote: "Mine finally bloomed and isn't nearly as blue as Mary Sue's plants, in fact it's nearly white." Photos 4-6 were taken by Nhu Nguyen are of plants from seeds collected in Chiapas, Mexico. Orthrosanthus exsertus is endemic to Mexico. It is found in the states of Nuevo Leon, Tamaulipas, Michoacan, Puebla, Oaxaca and Mexico State. 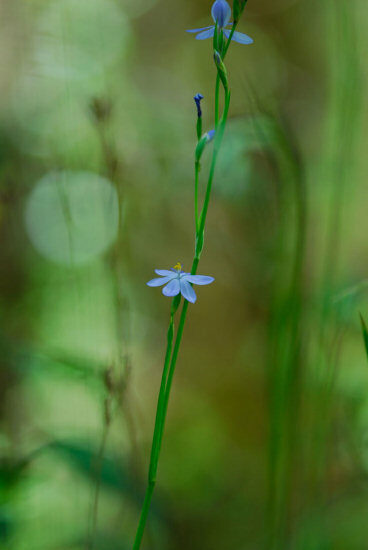 The flowers are a beautiful celestial blue color, but maddeningly ephemeral. From my experience, the flowers are visible only from 10-3pm and start to wilt by early afternoon. It is found growing in very moist and shaded Quercus forest, Alnus forest or coniferous forest. The plant is about 70 cm. 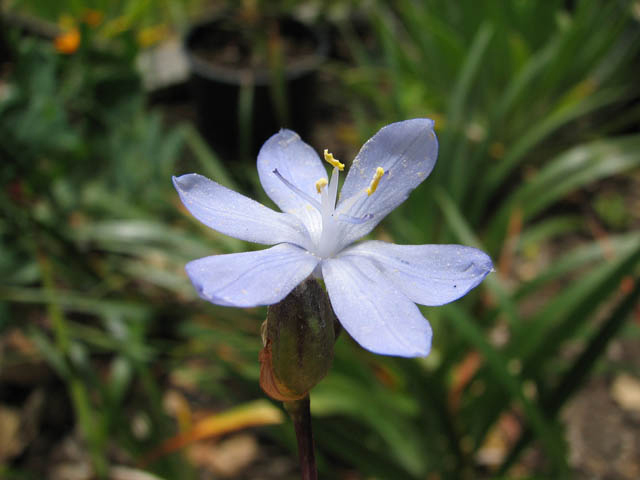 tall with a tuft of basal linear leaves reminiscent of Dietes. It grows at high elevation between 2500-3300 meters above sea level so it is adapted to endure short periods of frost in its native habitat. Probably hardy to about zone 8a but it cannot withstand high temperatures. 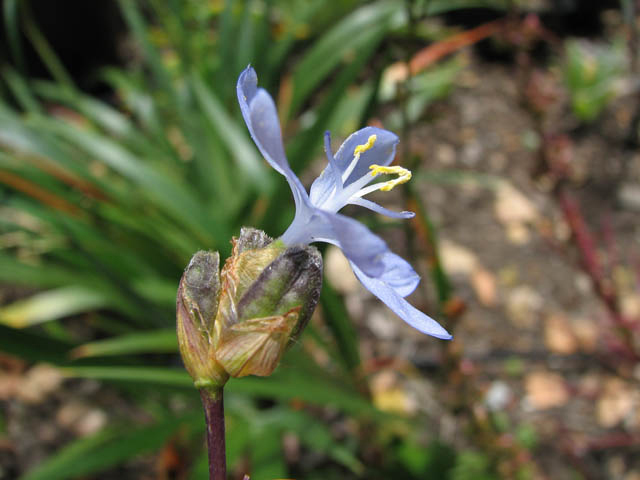 This plant is known by various synonyms and has been known at various times as either a variety of O. chimboracensis (var. exsertus) or as a subspecies of O. mondadelphus (ssp. mondadelphus). Photos were taken by Dennis Szeszko in-situ in Mexico State in the month of April on the western slopes of the Nevado de Toluca volcano. Orthrosanthus laxus occurs over a wide range in southwestern Australia in a variety of soils often moist for a period of time. 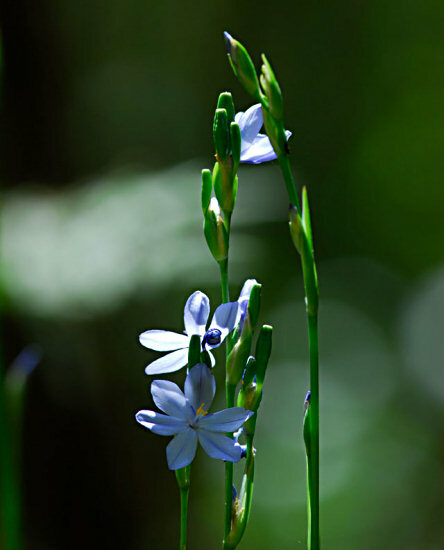 It is a rhizomatous perennial with grass like leaves from 10 to 45 cm tall and a few branched inflorescence to 70 cm tall with pale to bright blue, rarely white flowers. It blooms August through November. Photo taken by Bob Rutemoeller near Pemberton in southwestern Australia September 2007. 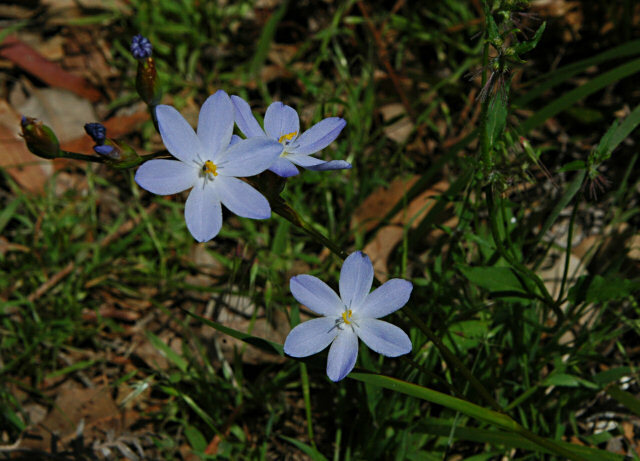 Orthrosanthus multiflorus is an Australian species found in south western Victoria, South Australia and from Israelite Bay to the Stirling Rance in Western Australia. 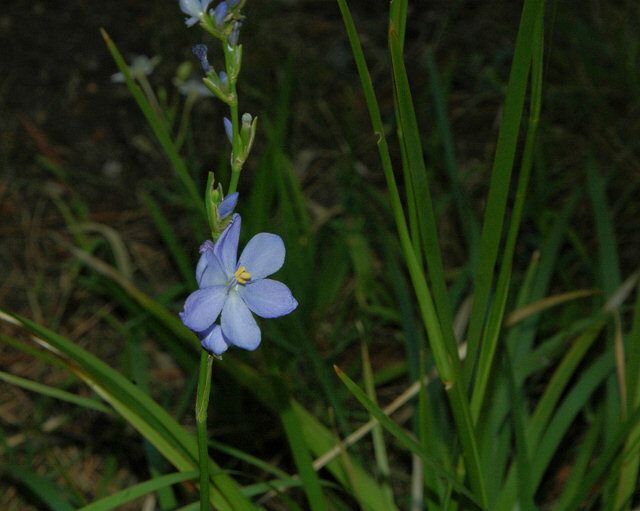 It grows in shrubby heathland in coastal and adjacent areas. 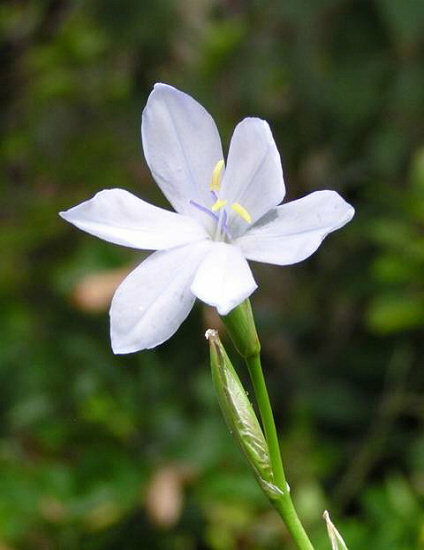 It grows to 1 m tall with spreading branches and has pale blue flowers to 4 cm, often profuse. 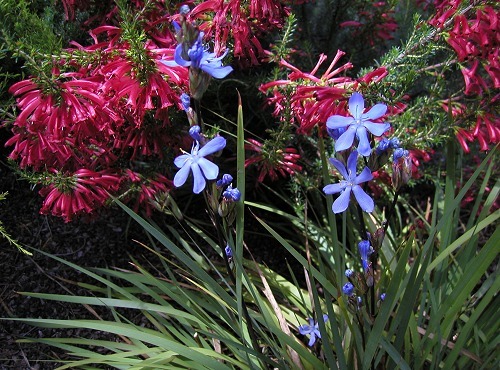 The first two photos taken by Mary Sue Ittner of plants in her garden grown from seed and the second two taken by Mary Sue Ittner and Bob Rutemoeller in southwest Australia near the Stirling Range National Park September 2007. 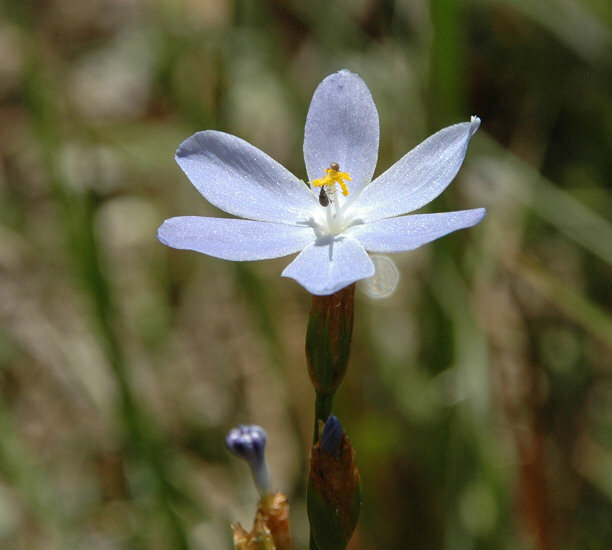 Orthrosanthus polystachyus from southwestern Western Australia grows in forest gullies and along water courses. It prefers a semi shaded site that is moist for much of the year. 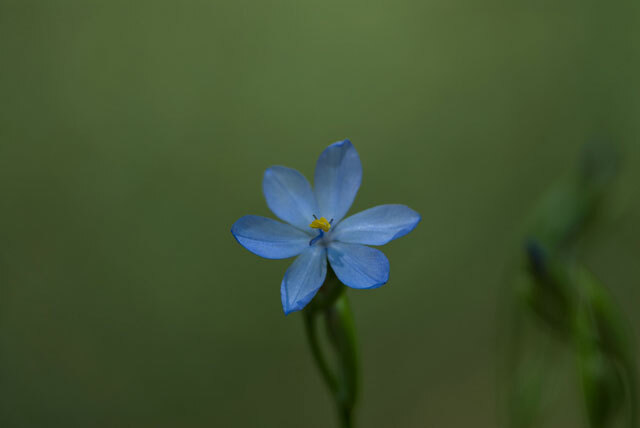 The blue flowers appear in spring. Photos by Mary Sue Ittner.